This took me WAY LONGER than it should have, it was my first time doing the SA2B colour style. 35 layers and 5 hours later. I need to work with smaller canvases. Geez. Anyway! Personality: Selfish, manipulative, self-centered, and hot-headed. She truly only cares for her love. 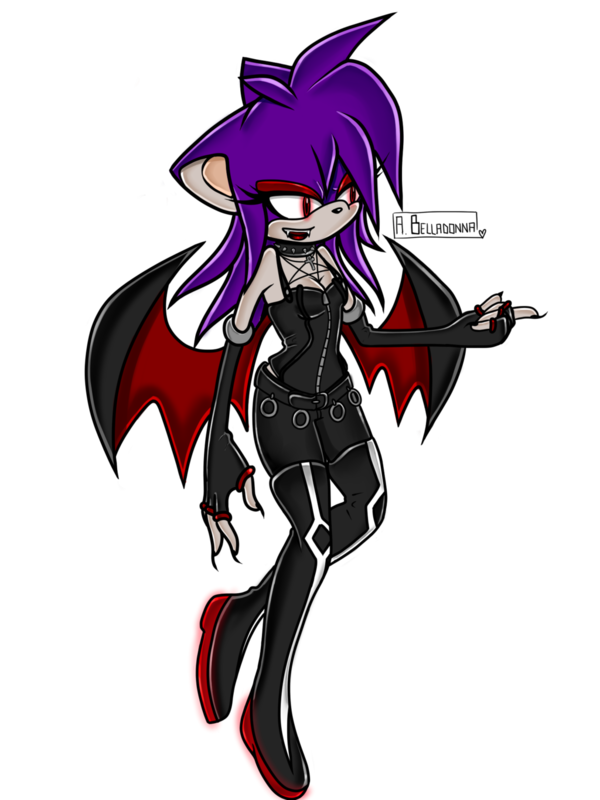 She hasn't dealt with friendship ever, as she tends to view people as nothing but blood banks and pawns. Inside, she's a bit warmer, and a very loyal bat. You just... really have to stick around to see it. During her mortal life, she's learned to stay away from people due to being hurt and manipulated herself, which is why she tends to push everyone away with her selfish behaviour. Only one has broken her barrier, hence her loyalty toward him. Other: Her favourite blood type is O Negative. Tracking - Once Amaris has tasted your blood or formed a blood bond, if you're within a certain mile radius, she has the option to track you down again. It does get very overwhelming if there's too many 'scents' going on if she's tasted too many peoples' blood and they all are in the same area, she will the confuse them all. Blood bind - If for whatever reason she can manipulate you into this, she has the ability to read your mind. And depending on how weak the mind, invade thoughts persistently and gains some influence as to your actions (not complete control however, she's not that powerful) The amount is determined by the will of the victim. However, you gain a small portion of her power in return. Garlic - A vampire's natural enemy! While not deadly, weakens her for a varying time depending on if just smelled or consumed. Water - Amaris cannot swim. She can float, but is unable to go under water. She's fearful of it. Chaos Emeralds - It's really unknown as to what causes it, but around Chaos Emeralds, Amaris gets strong migraines and her vision begins to fade. Within mere minutes of being very close to or in direct contact with one, she passes out. She is unable to use any of her abilities when near one. Day - Of course! During the day, her skin can burn, and her powers are very weak and likely to fail. Eyes: They always glow. Dim when low on energy, bright when filled with vigour! Fur: There's fur about her head, and it trails down her back, down to her tail in an upside down triangle motion. Skin: Pale and gray-ish. No warmth at all due to no blood. -She has no reflection, nor a heartbeat. -She also cannot die of lack of sustenance. She just becomes very weak, and unable to focus on anything but blood and satiating her thirst. There are ways to kill a vampire though, naturally! -Instead of blood, Amaris has this thick, black, tar-like substance in her veins. It's toxic in large amounts if consumed by non-vampires, and it is a vital part of the turning process. To vampires, it just tastes awful, and not recommended. It's rumoured that certain supernatural types of people think it tastes quite delicious though, like candied rose petals! *Misc. Fact! Amaris is quite skilled with the violin and harpsichord!